At the beginning of the summer we reported about interesting event organized by Ubisoft. That time the developers were asking every fan of Assassin's Creed series to take part in creating the project's painting to leave the footprint in the history of Black Flag game. And today this great canvas has been revealed. 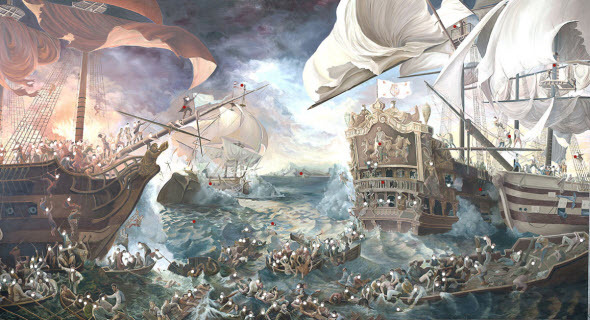 Huge painting describes the epic sea battle, in which about a hundred of people is involved. And each person from the canvas is a real fan of Assassin's Creed 4 game. On the specially created site you can zoom the picture to see the faces of the painted people and even compare drawn portraits with real photos. The painting shows the variety of gamers, who like this famous action-adventure: people of different ages and from various countries. Also on the digital version of the Assassin's Creed 4 painting you can find numerous red spots. If you click on any of it, you will be able to watch the short video about the certain game's feature or function. Assassin's Creed 4: Black Flag is the next instalment in the famous series of action-adventures. The game's versions for current generation of consoles will be released in the end of October, the versions for next generation of consoles are coming on the launch day of PS4 and Xbox One, and Assassin's Creed 4 for PC will be released sometime in November.